My little spaghetti squash is getting SO big, and so is Mamma! The poses just get more and more awkward each week, sorry....I just don't know what to do with my hands! Changes I've noticed: I'm really starting to notice the weight gain, I'm up 14 pounds so far. My doctor says I'm RIGHT on track and he feels really good about the steady increase so I'm not too worried about it. It's just crazy to watch those numbers go up, up, UP! It's all for my little peanut though, so I'm happy she is a healthy growing girl! I can still see toes! How I've been feeling: I've been okay, tired as usual and SO emotional! I'm already an emotional person, so now it takes the slightest thing to set me off! I had an incident the other night that I could probably write an entire post on...but to sum it up, I cried (hysterically) because of lack of snacks at work! Maybe I will tell you all the story some day! Right now I'm just feeling incredibly overwhelmed by work...just trying to make it through the end of the school year! 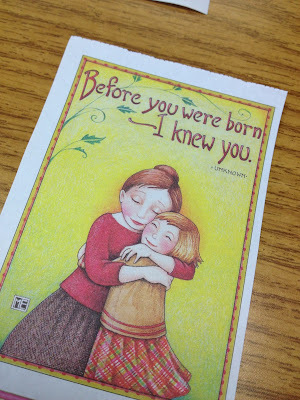 A co-worker gave this to me...I almost lost it, awwwww! How I've been sleeping: HOLY CHARLIE HORSES!!!! My calves are killing me! Saturday, I woke up at 3:30 with one in my right leg, then again at 5:30 with one in my right leg! I've been drinking a TON of water to stay hydrated, and stretching before bed to avoid them. It has worked for the past few nights, I will keep you all posted! Food and exercise: I felt good participating in the Green Smoothie Challenge! I definitely plan to keep it up, it's such a good (and delicious) way to incorporate vitamins into my diet! 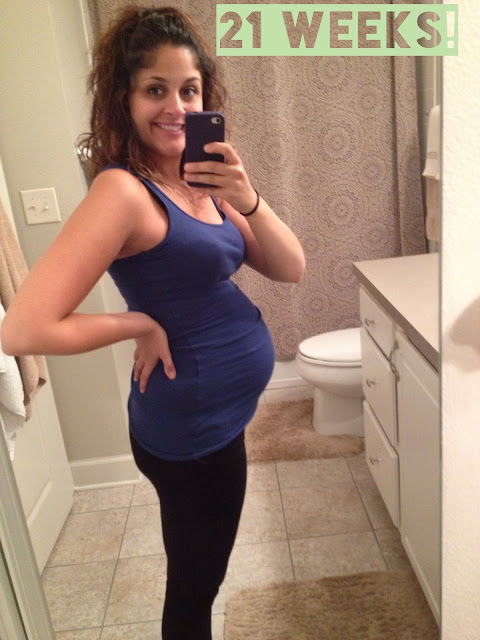 Does anyone have any recommendations for pre-natal yoga videos (or any other workouts for that matter)? Any of the "on demand" workouts I have done have been really cheesy! I feel like it's hardly a workout! Maternity clothes: I want more, I'm already sick of rotating the same few things but I feel like it is such a waste of money! I think I will try to hold out a little longer because it is getting HOTTER out and I am just getting BIGGER! Maybe I'll give it another month before breaking down and getting a few more items! Movement: My little wiggly princess is on the move CONSTANTLY! I can feel it from the outside but it's not very strong, and I still can't get hubby to catch it when it happens. Best moment this past week: Went to the doctor and heard her sweet little heartbeat on Monday....best sound ever! Aww I was super emotional at work too. I kept my sleeves rolled up and one day my boss told me I needed to unroll them because some big boss lady was coming and I started tearing up. Then when we weren't allowed sodas anymore except from a little cone cup, I cried about four times that day at work. Even though it was really not that big of a deal haha. look at that cute bump!! so excited for you. Charlie horses are awful! I have had them three times now and they were so bad that my calf was sore for the next two days. Luckily my husband is a physical therapist so when I get them in the middle of the night and he hears me complaining he stretches them out and they go right away! But they are crazy painful and no fun at all! I hope yours get better and don't come back - my mom said bananas help although with her bananas solve any problem haha. Get regular maxi dresses! You dont have to buy maternity because they have so much room to grow...and then you can wear them after you are pregnant too! Old Navy had 30% this week so I stocked up! Awwwww! But you are STILL so tiny! You look adorable! you are all bump! you look great!! 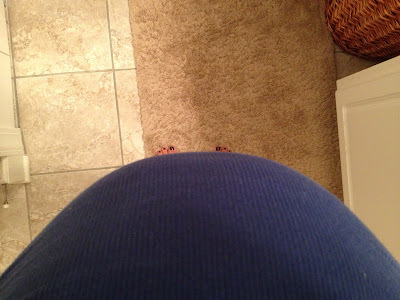 I did a lot of Hatha yoga when I was pregnant. The sessions I took focused on the hips, lower back, and legs. I wish I knew of a DVD to recommend :( maybe google it?! I had those terrible leg cramps too and yoga really seemed to help! Hello Friday, we meet again! High five for making it to Friday! Guest Posting @ Mal Smiles Today!!! Friday means it's almost beach time! I Get So Emotional Baby! Real Life Blog Friends Book Giveaway!!! Busy w/ family....be back soon! Guest Posting @ ABpetite Today!!! THE Friday I've been waiting for!! !